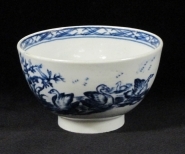 This teabowl printed with The Three Swans pattern decended in the Goulding family, eventually being presented to the Potteries Museum. William Goulding was an original partner in the porcelain factory. This is the reverse print on The Tree Swans teabowl. This Isleworth saucer is printed with The Three Swans pattern that depicts them swimming in the foreground, with other birds amongst island trees in the background. This attractive print is rare. The trellis border is painted. This saucer was in the Watney collection. A shard printed with this pattern was recovered close to the factory site.